I hosted a very modified wassail for about 15 of my friends here in Indiana. No orchards, no bonfires, unfortunately, but as it was only about 15 degrees F, I think we were happy to stay inside. But I got out the stash of cider I have been collecting and hoarding for a celebratory tasting. I was really excited by all the questions my friends asked about cider! It made me realize that even amongst my friends, who listen to me rattle on about it endlessly, there was a severe lack of information about cider. It was not something they knew much about, beyond Woodchuck, Angry Orchard, and Strongbow. We have lots of market education work to do cider community! From across the pond, we started out with the commercial giant Strongbow*, moved onto the Virtue/Oliver collaboration Goldrush*, jumped the channel over to Normandy for Etienne Dupont Organic 2011*. I then broke out a John Teiser special – a single variety Damelot cider as an example of a very tannic French variety. Then we jumped back to England for a taste of Perry – the Holmer from Ross on Wye. People generally really loved these ciders, with the exception of the Damelot, which was unsurprisingly palette challenging. Special appreciation went to the Gold Rush – which surprised people with its complex tannin, and to the Ross on Wye Holmer Perry, which was of course delightful and a new taste for most. Next, we headed to the Northwest Coast of North America – two from British Columbia and two from Oregon. We began with 2 Towns Ciderhouse Nice and Naughty from Oregon, which was a bit perplexing. I think we weren’t quite sure about the spiced flavor. Perhaps we just weren’t in the right holiday mood for it. We then moved on to the Left Field Cider Big Dry from BC. Some folks found the aroma a bit challenging. I had tried the Little Dry while back in BC, and I believe I preferred that cider’s cleaner, more fruit forward taste. We then opened the Sea Cider Pippins from BC, to which almost everyone responded with exclamations of enthusiasm. One person said if they didn’t know it was cider, they would have assumed it was wine. A very complex rich flavor. Finally, the Wandering Aengus Wanderlust* from Oregon, which we found very simple and straightforward, which split the field between those who liked a more straightforward flavor and those who liked something more complex. Then onto the Northeast. We began with Farnum Hill from New Hampshire, moved onto Hudson Valley Farmhouse Cider from New York, and finished with Aaron Burr Homestead Apple from New York. All were well liked, and my wine-distributor friend noted that they all improved with a bit of breathing. The flavors in these three seemed to develop gradually, both with a little time in the glass and a little time on the tongue – first seeming quite simple and then unfolding on the palette. And then we came back to the midwest with two ciders from Michigan for a sweet finish. First the J.K’s Scrumpy Farmhouse Organic* and then the Zombie Killer*. 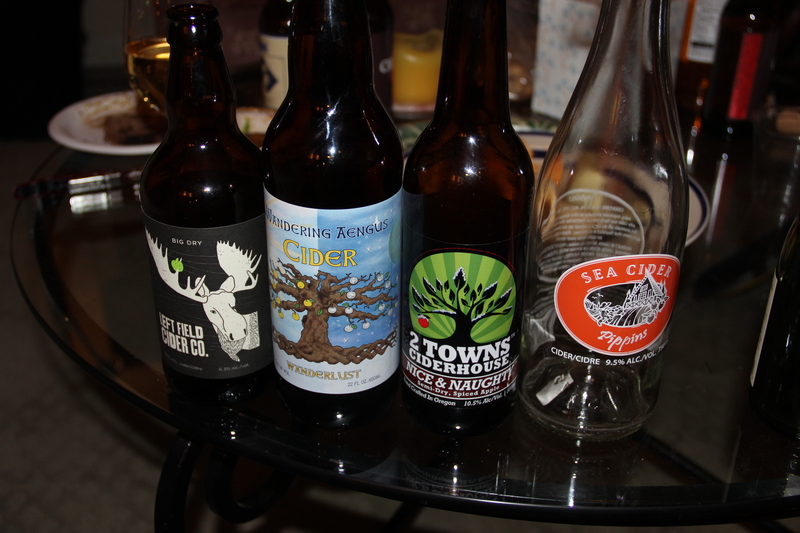 Both ciders were quite sweet – and after a tasting full of dry ciders, response was mixed. Many found these much too sweet, but the Zombie Killer – actually a Honey, Cherry Apple Cyser, was very interesting – something I can imagine sipping over ice on a hot summer day. Thus finished our wassail! It was a really great way to pass on the Gospel of Cider to friends and foodies in my neighborhood. My cupboards might be a bit bare at the moment, but it was much more enjoyable to share these lovely ciders and enjoy them with other enthusiastic tasters. Hopefully, I’ll collect some more at Cider Con 2014 next month. *Asterix indicates ciders which were available at a retail outlet in Bloomington, IN. All other ciders were acquired by me and lugged home in a suitcase from some travel adventure. This entry was posted in Events, Midwest, North America, Tasting. Bookmark the permalink.